NextThree Reasons a2z Loves to Exhibit at IAEE’s Expo! Expo! 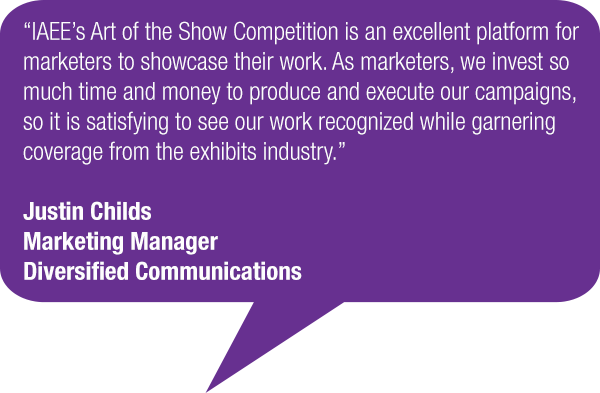 IAEE’s Art of the Show Competition celebrates outstanding promotion of exhibitions and events in 15 categories, including Email Promotion and Exhibit Sales Brochure/Prospectus. Any .html-based promotion disseminated to an audience in hopes of gaining attention for an exhibition. Judges take into consideration creativity, effectiveness of message, design aspect, copy and overall presentation. The Subject line may sabotage your delivery. The subject line should not only catch the reader’s attention and entice them to continue, but certain words can sidetrack your email directly to the spam filter. Beware of words such as “free,” which typically trigger spam programs. The From line is almost as important as the subject line. These two pieces of information constitute your email’s “first impression,” so you want them to work together to inspire the reader to open your message. Establish a reputation for communicating effectively and watch your open rates increase as people come to know your emails are not junk. Quality vs. Quantity. Don’t you just love sifting through tons of content to find the key message? Yeah, no one does. You may be using graphics, short and punchy text, or a combination of both to deliver your key message. Whichever route you take, show your readers you are respectful of their time and that your messages are worth reading! A single sales piece targeting potential exhibitors. This does not include any print advertising. Judges take into consideration creativity, clarity of message, design, layout and copy. Where’s the beef? You are selling to salespeople, so let’s get down to business shall we? Have your event audit, show stats, floor plan, booth specs, cost breakdowns, provider info – anything and everything your exhibitor wants to know, and then some – ready and available. Depending on how extensive you want this piece to be, you may or may not include all this information. But you definitely want to have it ready to send to anyone who requests it. Welcome new exhibitors with open arms. Unless you are launching a new exhibition, you most likely have a fairly large group of repeat exhibitors who know the drill. However, you want new exhibitors as well, right? Make sure you look at this piece through their eyes and address their concerns effectively. You may even find you need one piece for returning exhibitors and one for potential first-timers. Design principles still apply. This target audience may be more bottom line-driven than most, but a long list of information is unappealing to anyone – and unappealing does not sell. Remember that the brain uses visual cues to process data so use your show branding, organize your information, hone your messaging and yes, make it all nice to look at. Three Reasons a2z Loves to Exhibit at IAEE’s Expo! Expo!